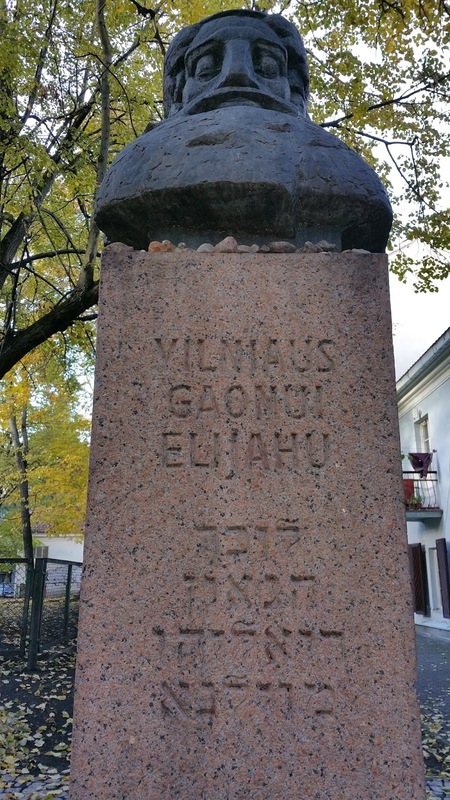 The center of the Vilnius Jewish tourist route is the site of house of the Vilna Gaon (Eliyahu ben Shlomo Zalman), the great Talmud scholar and the leader of Lithuania's misnagdim in the 18th century who is still revered by observant Jews for his learning, judgement and piety. For all others, The Gaon has become of symbol for a world of Lithuanian (Litvak) Jewry that is no more. In truth, already before the Holocaust Vilna's Jews had fractured into many religious, cultural, and political factions, so the Gaon's memory was not celebrated by all. But after the destruction of the Holocaust, when all faction became one: the murdered Jews of Vilna and the Gaon's memory, his name and image, took on sainted, or at least surrogate, status. In 1997 on the 200th anniversary of the Gaon's death the city of Vilnius and the government of Lithuania helped sponsor a number of commemorative initiatives. For some, there was altruism; for others opportunism, a chance to improve among some Jews and Jewish organizations Lithuania's less than stellar record of Holocaust recognition and education. Commemoration of the Gaon was nothing new. On the 100th anniversary of his death there were remembrances and circulation of commemorative portraits for veneration. 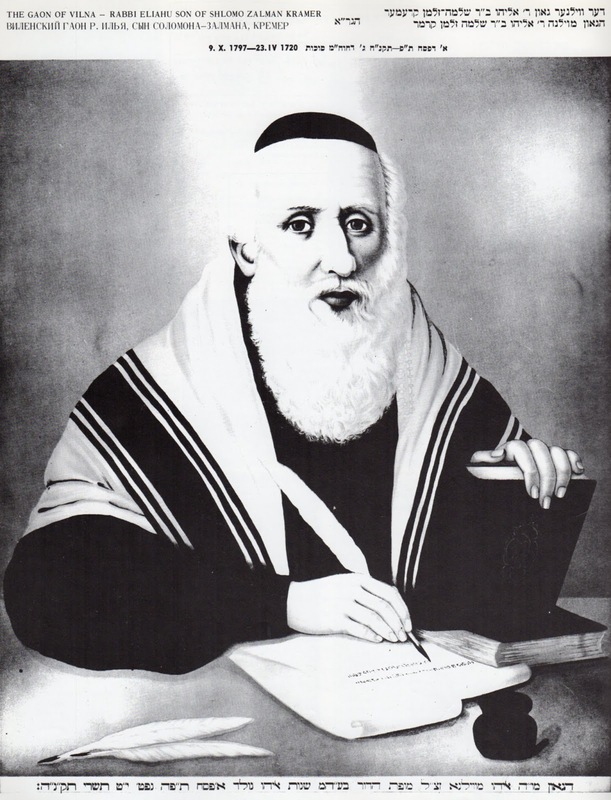 Commemorative Portrait of the Vilna Gaon. 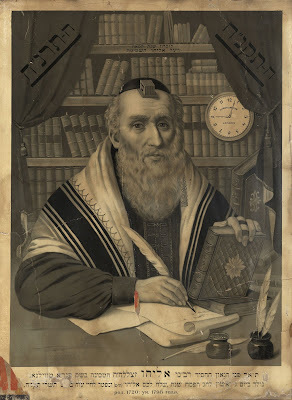 Lithograph, 1897. Photo courtesy of the William A. Rosenthall Collection, Addlestone Library, College of Charleston. Central to these events was the unveiling of a commemorative plaque on the wall of house next to the one - now demolished - where the Gaon lived. According to Irina Guzenberg, in her Vilnius: Sites of Jewish Memory, A Concise Guide (2013), the plaque was unveiled on September 12, 1997. On the site of the house itself bronze bust of the Gaon on a tall pedestal was installed. Jewish visitors who flock to this site and to the monument are often perplexed by the work. First, given his devotion to Halacha (Jewish law) and tradition, it is doubtful that the Gaon would have approved of any sculpted portrait, let alone his own. And then, even if one accepts that the bust is OK - why is the Gaon shown without a head-covering? Surely he never appeared in public this way. In printed portraits of the Gaon he is shown with kippah and even tefillin. Cordoba, Spain. 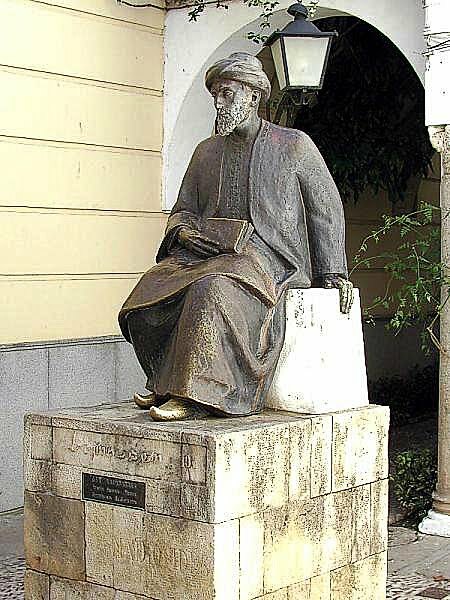 Maimonides statue, Tiberiadus Square & Prague, Czech Republic, Rabbi Loew Statue. Of course, Vilnius is not the first city to erect a statue to a Jewish sage for civic reasons. 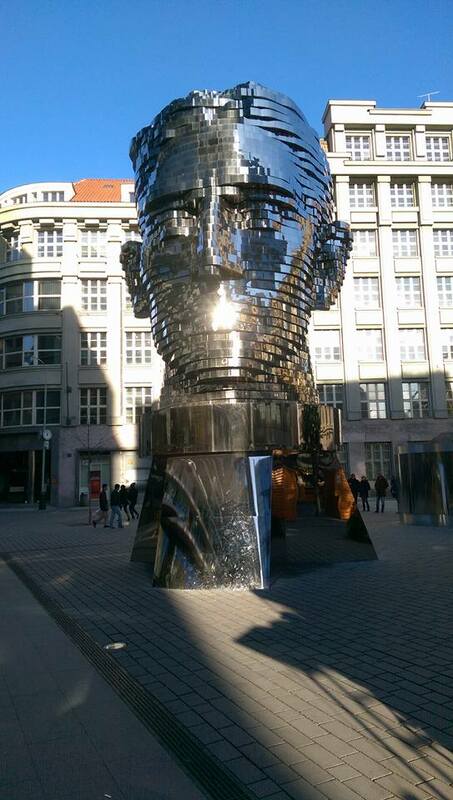 There is a statue of Rabbi Löw (Maharal) by the Art Nouveau Ladislav Šaloun on the New City Hall of Prague erected ca. 1910 (photo here) and one of Maimonides in Cordoba installed in 1964. These are all productions of local authorities trying to the right thing. 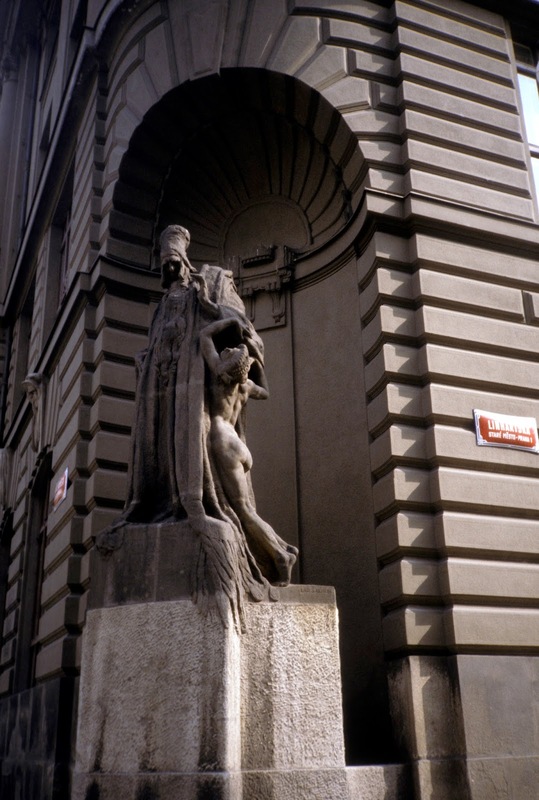 In Prague, the Maharal was a central figure in local history and a character in local lore, hence his inclusion on the City Hall which is located not far from the Prague Jewish Quarter. In the case of Spain, there was no doubt a element of civic pride, but also possibly an accommodation of hoped-for Jewish tourism, too (this seems a little odd, since this was installed in Franco's Spain - so anyone with information on the origins of this statue please let me know). 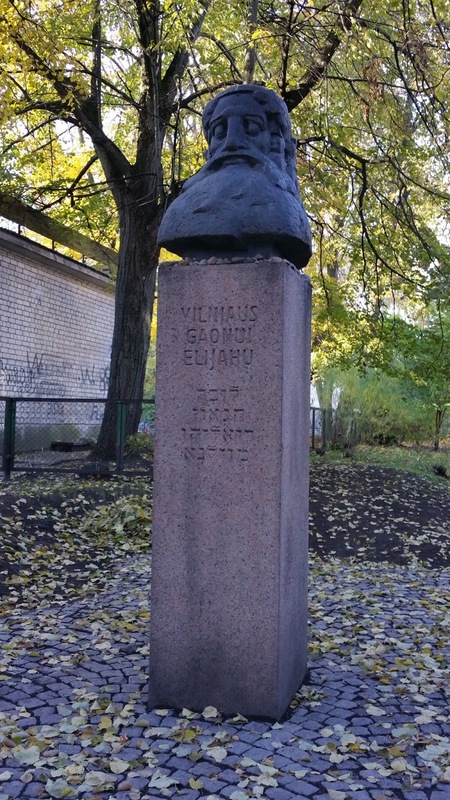 The Vilnius depiction of the Gaon, by sculptor Mindaugas Snipas, is not in fact a representation of the Gaon at all, but a stylized work based on an earlier, now lost, plaster bust called The Jewish Sage by Teodoras Kazimieras Valaitis (1934-1974). 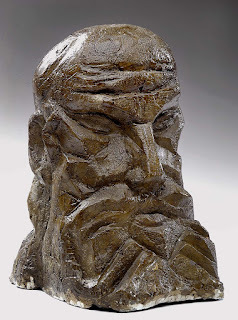 The work also recalls the large bronze heads of Moses sculpted by was a Lithuanian-born American sculptor William Zorach (1887-1966) in the 1950s. Zorach was born in Jubarkis and emigrated to the United States with his family in 1894. Moses. William Zorach, sculptor. Smithsonian Museum. 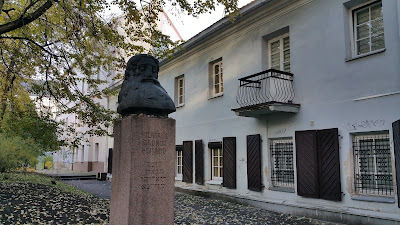 I'm not really bothered by the Vilna Gaon bust and I'd be much less bothered if this single statue didn't loom so large in the Jewish heritage cityscape of Vilnius. For several years after the unveiling of this statue it seemed that local officials felt this was enough recognition of the Jewish past. The city was developing rapidly, the old Jewish neighborhood represented desirable real estate, and the municipality especially had other things on its mind. Only slowly, and now in the last few years a little more quickly, has the pace of recognizing other spaces and places important to Vilnius's Jewish history and other Jewish individuals central to its history, picked up. Since 2007 a number of commemorative plaques have been installed on buildings throughout the city remembering a number of important Jewish individuals including politicians, writers and artists. 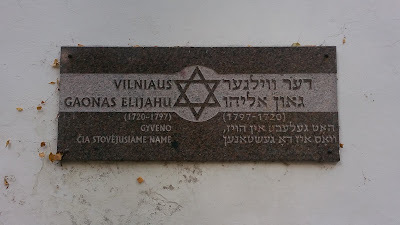 Most of these are plaques and have been installed in cooperation between the Jewish Community of Vilnius and the local government. Most are illustrated and described in Guzenberg's guidebook. While it recognizes Jewish history, it should be remembered that the Vilna Gaon bust is just one of many patriotic and nationalist sculptures that adorn modern Vilnius, some even dating to the Soviet era, such as the large bronze seated figure of Lithuanian novelist Žemaitė (1845-1921), whose real name was Julija Beniuševičiūtė-Žymantienė. Since Lithuanian independence there has been an ongoing effort to install more sculpture to celebrate Lithuanian national themes, including language and art. So, in this context, including the Vilna Gaon in a sculptural cityscape of Lithuanian nationalism is a notable step. Any such "integration" has not been the case at Vilnius's so-called Museum of Genocide Victims, where before 2011 there was no mention of genocide of Jews. In the unique language of the Vilnius museum, the term Genocide is used only to refer to the Soviet repression of ethnic Lithuanians, not the German and Lithuanian fascist killing of the city's Jews. A new book expected out this week in Lithuania, may address this still "hidden history." 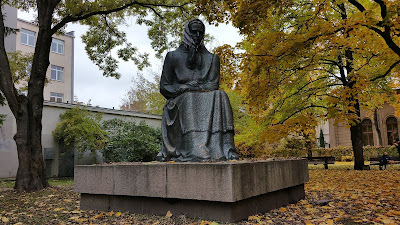 Lithuanian novelist Žemaitė (1845-1921) (Julija Beniuševičiūtė-Žymantienė). In Vilnius there is one other free standing bronze sculpture with a Jewish theme; this a 2007 statue commemorating 19th-century Jewish doctor and community leader Tzemahk Szabad (1864-1935). 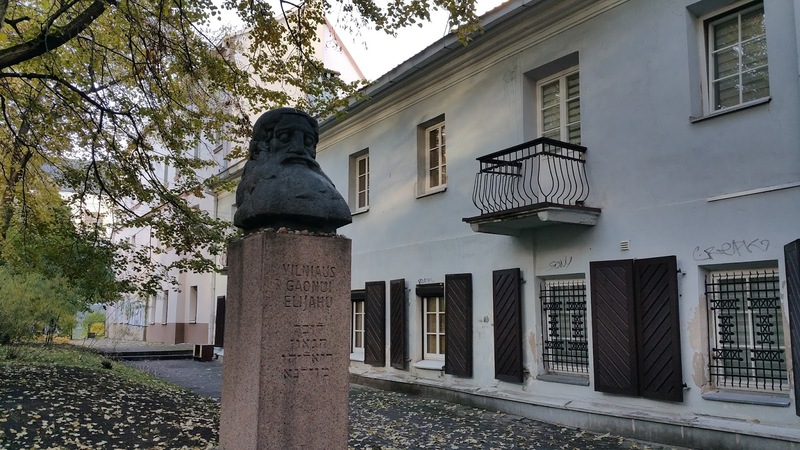 This was sponsored by the Litvak Foundation and is situated in the Old Town at Mesiniu and Dysnos Streets, near where Szabad was born, and carries the inscription: "In Memory of Doctor Tzemakh Shabad and Vilnius Jewish Community." Shabad was an important man in his time. He was a leading physician, scientist, leader of the Jewish community and active in Vilna and Polish politics. 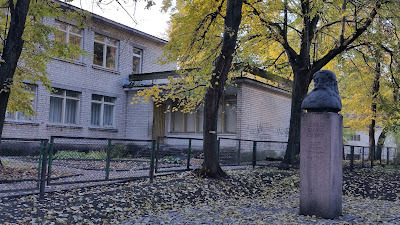 Born in Vilna but educated in Moscow, he was a force for progressive medical and social action and in many ways his active secular life was an alternative to that represented by the Vilna Gaon. 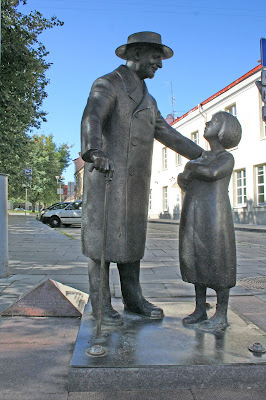 The real popularity of this statue in Vilnius, however, apparently has nothing to so with Szabad's Jewish credentials, but is because he was the inspiration of a Dr. Doolittle type character in a well-known children's book. Szabad was, in fact, previously commemorated in the public monument in with a portrait bust at the TOZ (agricultural) colony of Pospieshki. The monument is illustrated in Letzer Ran's Jerusalem of Lithuania. I don't know where this colony was/is, and it is doubtful the monument survives. Vilnius, Lithuania. Statue of Doctor Tzemakh Shabad, 2007. Pospieshki, Russia (?). 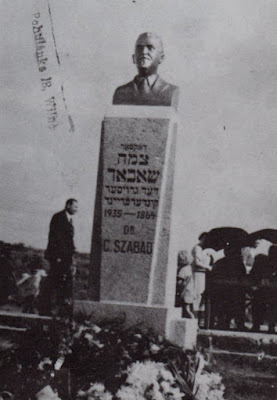 Doctor Tzemakh Shabad monument at TOZ Colony, after 1935. Photo: Letzer Ran, Jerusalem of Lithuania, vol 1, p. 137. 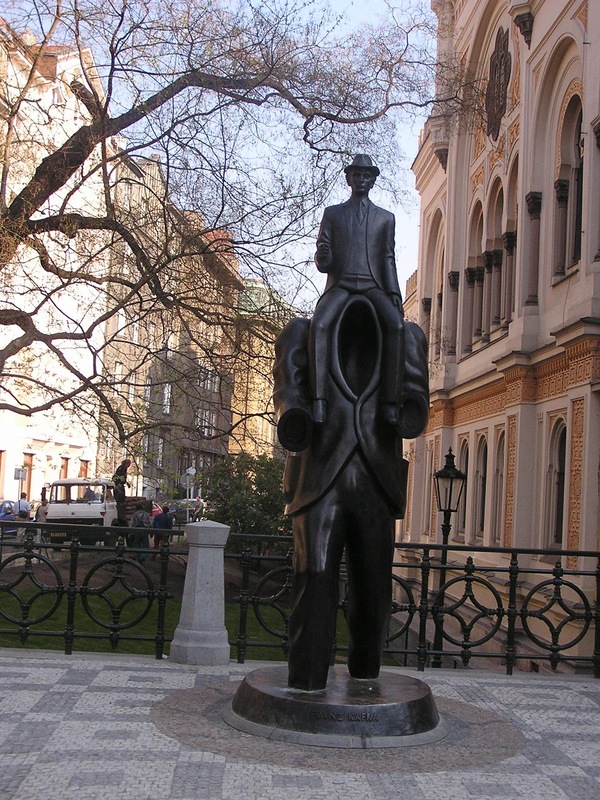 Since the 1990s there have been many statues erected in Eastern European secular Jewish heroes - Shalom Aleichem, Franz Kafka and others. I'll address these in another post. Happy Birthday Chaim Soutine (1893-1943)!